The Alton Mission will begin a worship gathering on Sunday, September 9, 2012. And while this is a big change, it doesn’t change the main thing. More will be written here over the next couple weeks about this worship gathering beginning, but this post is a quick reminder. Restore Communities are the main thing. A Restore Community is a medium-sized group of people (up to 40 or 50) committed to being the church together for the benefit of their neighbors. The Restore Community is the primary expression of what it means to be the church. This is the main thing. We talk about “being the church” more than “going to church” to emphasize that the church is not a building, nor is it a bunch of programs or activities. The church is the body of Christ, the people of God living like missionaries in the world. Being the church means belonging to a community that integrates love for God, love for one another, and love for our neighbor. 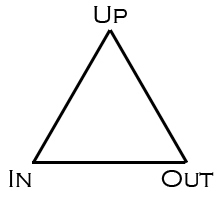 The triangle shape reminds us that the Kingdom of God becomes tangible as we participate in Communion (Up), Community (In), and Mission (Out). So each Restore Community creates a covenant that spells out what they’ll do in each of those areas and who will help lead. So where does the worship gathering fit in? The Alton Mission exists to celebrate, develop, and extend the ministries of the Restore Communities in the Alton area. The worship gathering is our opportunity every week to do just that. But more than that, we yield to the Holy Spirit’s work in worship, prayer, scripture, and the sacraments to form us into the Body of Christ. More on that later. We are not beginning a worship gathering to attract new people. Some have suggested sites for the worship gathering based on reasons like, “This neighborhood could really use a church.” Since our primary expression of being the church is the Restore Community, we must insist on saying, “A neighborhood that really needs a church is a neighborhood where we should plant a Restore Community–not launch a worship gathering.” When you think of “church,” think of your Restore Community first and foremost, then think of the worship gathering as a secondary, supporting expression of what it means to be the church. We prioritize the Restore Communities over the worship gathering. If the worship gathering were ever to cease, our Restore Communities should be able to continue. But if our Restore Communities all tanked, the whole foundation of the worship gathering would collapse. We’re prioritizing the health and ministry of the Restore Communities above the worship gathering, and you should too. So if you’re having a crazy week and you can only go to one thing, go to the main thing–gather with your Restore Community. Skip the worship gathering before you skip your Restore Community. Of course, we hope no one will get into the habit of skipping either one. But we all have those weeks when something has to drop. Make sure your Restore Community is the last thing to go.